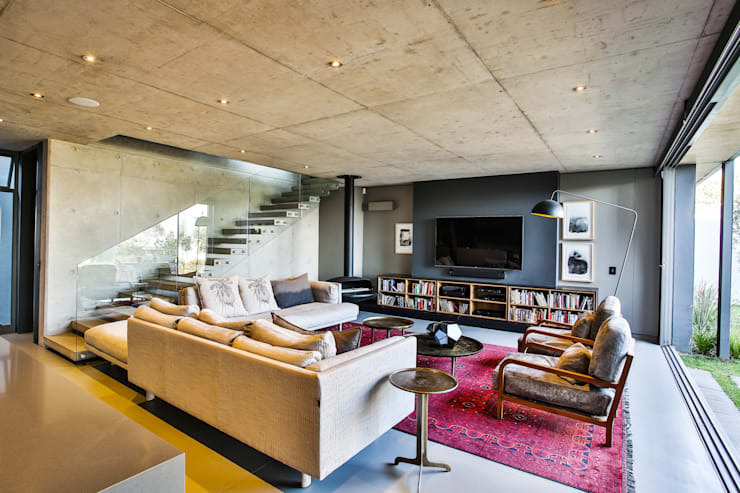 Pretoria-based firm Blunt Architects brings us our latest homify 360° gem: ‘House Pautz’, a modern stunner taking up an area layout of no less than 493 m²—perfect for those of us who like our living spaces super spacious! 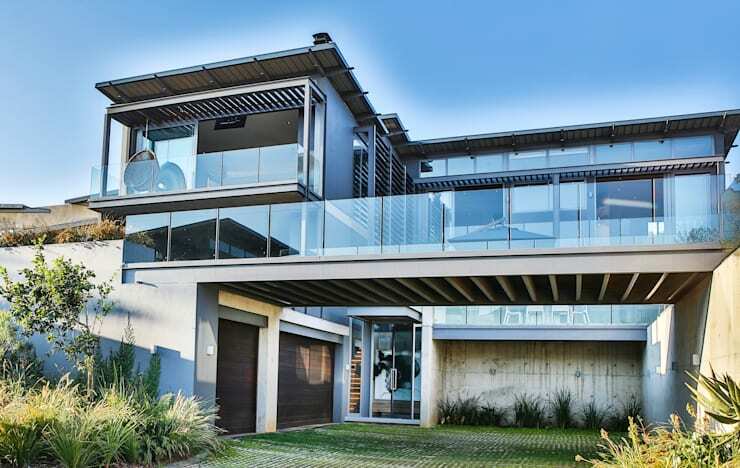 This elegant residence is a three-level structure designed on a restricted north-facing sloping site. The brief from the clients called for a home which opens to the northern view, but still provides adequate privacy when entertaining guests. Shall we see if the brief was met? 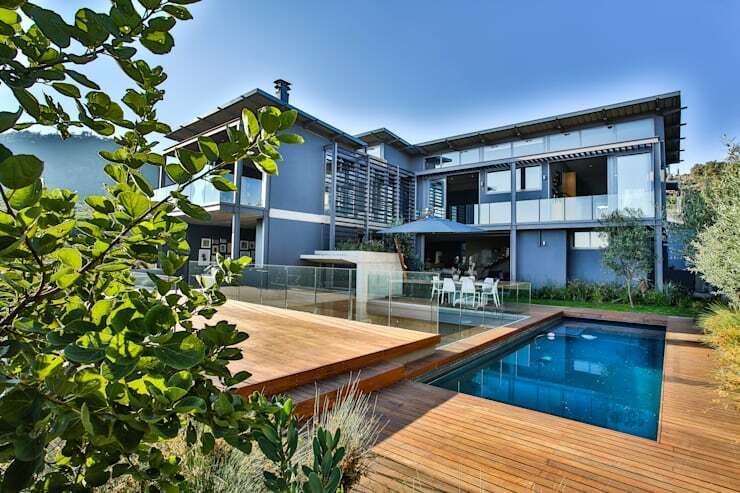 Don’t you just love the way in which raw design and sleek style merge to form this eye-catching beauty? The house is embedded into the hillside to create a basement parking and entrance lobby. A refined mix of materials define the modest construction; seamless floor and sliding glass planes with the robust concrete walls and soffit are seen throughout the project, balanced by its steel structure counterpart. The elevated living-, dining- and kitchen area, in an open-plan layout with large sliding glass doors, invite the inhabitants out to the entertainment and pool area on the upper terrace. And just see how the industrial architectural style offsets with the modern and classic décor and furniture pieces to produce an eclectic-theme interior – the perfect touch for when you want your interior spaces to be striking and memorable. We’re not sure about you, but here on homify we prefer our bedrooms to have breathtaking views. 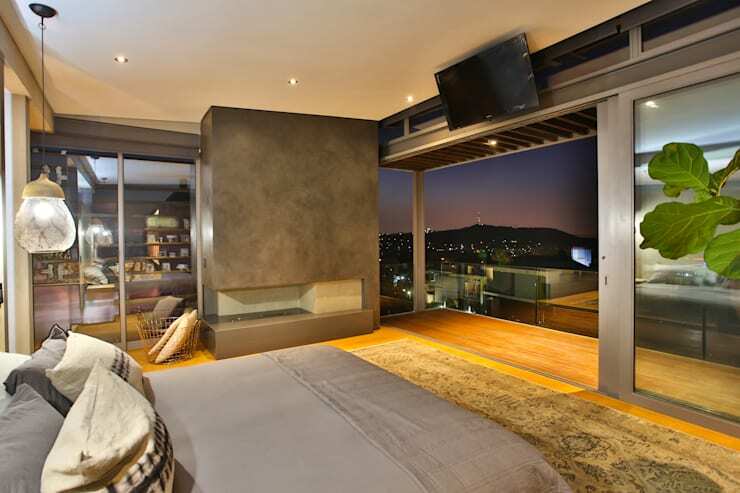 And this master bedroom, dressing room and en-suite provide just about the best views over the eastern suburbs of Pretoria. Now that’s one way to watch the sunset! Before we conclude this tour, we take one quick glimpse at the stunning back yard, which is styled up to perfection for socialising. After all, what else are you going to use a spacious wooden deck, swimming pool, exterior dining area and expertly trimmed garden for? Speaking of socialising, see these 8 smart and easy ideas for a party room at home. Is this house perfect for you, or not really?